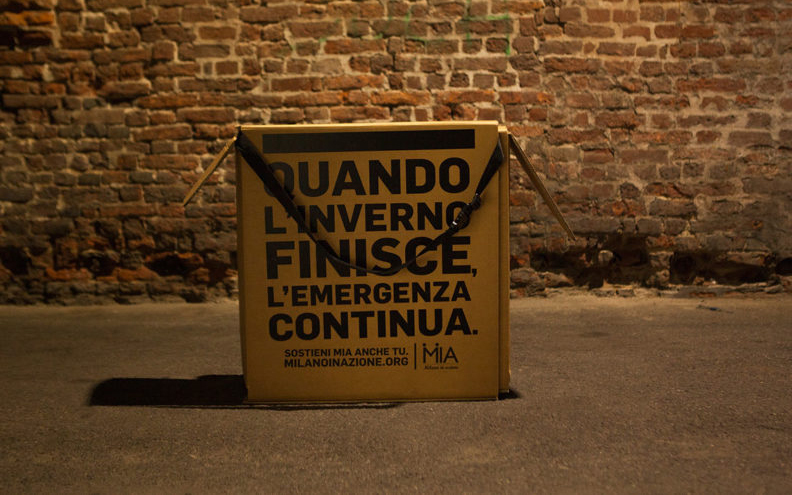 Milano in Azione Onlus (MIA Onlus) has launched the Shelter Box, a project designed to help the approximately 3,000 homeless people living in Milan. Over winter the number of beds in emergency shelters is increased in a temporary “cold floor” housing plan. However, come March 31, many find themselves back on the streets. “When winter ends, the emergency continues”. Some of these people have been on the streets for years, while others are recent arrivals, having lost their job, their home and love. MIA Onlus is distributing the Shelter Box that serves as a bed, chair, table and portable bag, providing shelter from the elements while sleeping, and storage of possessions during the day. The following commercial raises awareness of the post-Winter realities, and calls for financial support in extending the Shelter Box program. The MIA Onlus Shelter Box is a design product made of quality cardboard, durable and lightweight, able to provide maximum insulation from moisture. This box is composed of a telescopic structure of three elements that interlock and allow the product to easily turn into a bed, a chair, a table or a backpack. It can be transported as a container to be reused over time. At the end of the “cold Municipal Plan” (March 31), when many homeless people have had to leave their bed and get back on the road, MIA Milan in Action Fund has distributed the first modules to some of its clients but is now looking for financial support to grow the program. The MIA Onlus Shelter Box campaign was developed at Leo Burnett Italia, Milan, by executive creative directors Francesco Bozza and Alessandro Antonini, creative director Nicoletta Zanterino, art directors/designers Filippo Formentini and Marco Zilioli, copywriters Alejandra Gumucio and Andrea Zanino, product designer Andrea Longoni, and producer Alessandra Caldi. Filming was shot by director Claudio Gallinella via Bedeschifilm.